Ben and Brenda minister with a passion to equip and send pure-hearted, Kingdom focused lovers of Jesus into the great harvest that has begun on earth. They have ministered nationally & internationally and have taken teams to Africa, Asia, North America, and South America. 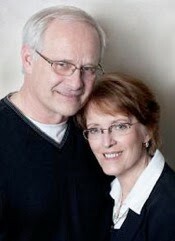 They began their ministry together for over 40 years, and minister with authority and wisdom. They currently reside in Lincoln, CA. Ben and Brenda Peters have said, "YES" to the call of God to challenge, equip and send dedicated lovers of Jesus into the harvest fields of the earth, including the seven mountains of society. Together they have ministered to tens of thousands of individuals in several countries of the world. After establishing churches and Christian schools for almost thirty years, they began a traveling ministry in 1999, under the name, Open Heart Ministries, speaking, teaching and prophesying in conferences, camps, churches, ministry schools (including Wagner Leadership Institute) and homes. More recently, they also founded an Illinois-based ministry, called, Kingdom Sending Center, after hearing from God during a Heidi Baker meeting in Chicago. Ben began writing revelatory books in 2000, and has published 22 of them since then, and his newest book is HOLY HOW? Holiness, the Sabbath, Communion and Baptism. Ben and Brenda have five children and 12 grandchildren. Ron and Valerie Coltman have wholeheartedly committed their lives to God's call on their lives to train and equip fully devoted followers of Christ to "go" to where He has called them to go. They began their calling on staff of CRU (formerly Campus Crusade for Christ) where they met serving at the International Headquarters. After establishing and fine-tuning their giftings and skills for over 18 years at Willow Creek Community Church serving in the Couples Small Group ministry, they joined Ben and Brenda Peters in 2002. Serving the Peters, they established and founded Kingdom Sending Center, and currently serve as Executive Directors of the ministry, and on the Board of Directors, respectively. Currently, Ron & Valerie give primary direction to all aspects of the ministry, including executive decision making, finance, marketing, and daily operations including overall training and development of "sent ones" as they prepare for their callings and destiny. They currently reside in West Dundee, IL. Many SENT ONES have been sent to serve at and with Kingdom Sending Center for a season(s) in a variety of ways & functions based on their God-giving gifting(s). For example, these key leaders lead and assist in the daily operations that allow us to run with greater efficiency and effectiveness. It is beautiful to watch the Body of Christ function as God envisioned.